The number one priority for ballistic missile defense as stated and outlined clearly by President Barack Obama is the defense of the United States homeland. The American public demands, supports and expects ballistic missile defense for the protection of the U.S. homeland. U.S. military and intelligence agencies have testified in Congressional hearings that the ballistic missile threat to the United States from North Korea is real and that Iran could have a capability as early as 2015 to strike the U.S. homeland. There are thirty Ground - Based Interceptors (GBI) deployed today that the Administration has deemed necessary to protect our nation from long - range ballistic missile threats. 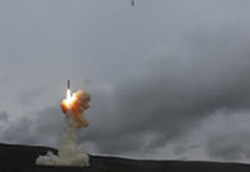 These thirty deployed GBIs also help dissuade North Korea and Iran from developing long - range missiles that could strike the U.S.
For the military, especially those in United States Northern Command (NORTHCOM), to fulfill their mission of defending the U.S. there must be demonstrated consistent success in the GBI's capability to intercept and destroy an incoming ballistic missile. The mission is too important to our nation's national security for it to fall short. The last two GBI intercept tests, and the only two conducted under President Obama, have failed to intercept leaving a lack of confidence in the system and a perception of vulnerability to North Korea and Iran. The last time the GBI had two failed tests in a row was between 2003 and 2005 when the system was being initially developed and was not yet fully operational. More priority and better focus is required to understand the problem within the system that has been successful in eight out of fifteen tests. It will take time before answers as to why this test was a failure come to light, but urgency is required to clearly resolve the issue and fix the problem. Initial analysis of the failed test looks similar to the earlier failed test this year, when at the last minute the Exo - atmospheric Kill Vehicle (EKV) failed to make the intercept. Tracking and discrimination information of the target from the sensors, most notably the Sea - based X - band radar (SBX), put the EKV in the right location. There has to be a focus on gathering a clear understanding of the root cause of the failure; from the first failure of the EKV this year to making the adjustments before launching a second similar test with a much more robust complex target and stretching the flight of the EKV to the farthest distance it has ever flown. This is especially important when these tests, including pre - and post - test analysis, cost the U.S. taxpayer over $150 million apiece from an already tight missile defense budget. Quality control will always be a challenge for a very complex system that has numerous points of failure linked to the sophisticated technology and coordination required to hit an approximately 6' long object traveling close to 15,000/MPH, 120 miles up in space with a missile launched thousands of miles away. Modernization is needed to reduce failure points across the system and increase its reliability. Modernization is also required for the sustainment of confidence in the system into the future; the system is expected to perform up to and possibly beyond 2030. This issue is even more acute with the EKV and its many possible failure points in both hardware and software. Currently the Administration sees modernization of the Ground - Based Midcourse System (GMD) as a low priority at best. This is reflected in the funding for the entire GMD system which at its peak accounted for more than thirty percent of the total missile defense budget but has been reduced to less than ten percent with minimal modernization funding. Despite the EKV missing the target, this past test performed extremely well in a number of areas. The sophisticated target missile, AN/TPY - 2 Forward - Based Radar, SBX, GBI and command and control are all complex systems that were coordinated with great success. The tracking of the target missile was successfully transferred from the Forward - Based Radar to the SBX to the EKV. This led to the EKV being in position to make a realistic operational intercept. There were also upgraded Aegis Ballistic Missile Defense ships that tracked the target missile and perhaps could have taken an early shot. All of these were significant events that are critical to the confidence in the overall missile defense system as well as providing valuable information for future modeling and simulation testing. Also notable was the successful use of the Forward - Based Radar in Wake Island north of the target launch. This would duplicate, to some extent the positioning of that same radar in Turkey for an Iranian launch missile towards Europe or the United States. An early conclusion that could be drawn from this test would point to lack of priority and focus over the past eleven months towards resolving the root cause of the EKV failure, one of the most critical elements in the GMD system. There have been eight successes with the EKV in flight tests which would lead one to assume that the engineering and technology can be resolved if attention, time and priority are put forward. It is also of equal importance that priority of modernization for the GBIs and its overall system be addressed by the Administration as it is the system that upholds and brings confidence to the President's number one priority for missile defense, the U.S. homeland. When there are failures and frustration, we must always remember that the American public expects, supports and will always demand protection of the U.S. homeland. Riki Ellison, one of the top Missile Defense Experts in the World, is Founder and Chairman of MDAA. He has more than twenty five years of experience as an advocate for the Deployment and Development of a Missile Defense System for missiles of all ranges.